New York, NY — The announcement was an immediate call to each of the Fund’s 25 affiliates to launch fundraising efforts in support of this big-ticket project. Building an alternate route between Armenia and Karabakh is the designated campaign theme of the upcoming Armenia Fund’s 16th International Thanksgiving Day Telethon. The goal of this massive public works effort is to turn the roads that currently link a string of strategically important towns in northern Armenia and northern Karabakh into a modern highway system. The new route is projected to promote trade, cooperation, and economic development among vulnerable border communities that are vital to national security. For some, this new initiative may beg the question: why another public road works project when there is the Goris-Stepanakert Highway? Since its completion back in 1999, that highway has proven to be the kingpin of the Fund’s sustainable economic development and security strategy. Prior to its construction, it would take several days to travel from Mardakert in Karabakh to Yerevan in Armenia. After completion of the Goris-Stepanakert Highway as well as the North-South Highway, within Karabakh alone, it now takes just nine hours. With the addition of the Vardenis-Mardakert Highway, there will be a shortcut through the north, which will take just a few hours to cross. Then trucks can reach markets faster, so that businesses can function. Equally important, supplies can reach military bases and local government centers promptly. In the map shown on the opposite page, the Goris-Stepanakert route connects southeastern Armenia with south-central Karabakh, ending in its capital city. That excludes access for both northern Armenia’s border communities and those border towns in Karabakh, which, 22 years ago, were delineated as part of the Azerbaijan Soviet Socialist Republic. Today, these villages are neighbors with a hostile Azerbaijan, creating a very different security dynamic. An alternative route connecting the two Armenian republics can make all the difference. The map also indicates the route of the Vardenis-Mardakert Highway that will link 16 village communities and the three towns: Vardenis in Armenia and Kharvachar and Mardakert in Karabakh. All told, that’s over 76 thousand residents who stand to benefit from the new highway. 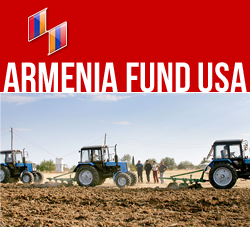 Khoren Bandazian, the chairman of Armenia Fund USA, explained the rationale behind the project. “Security is a high priority for both Armenia and Karabakh,” he said. “And the key to that security lies in demographics. The stable presence of an Armenian population is paramount. But keeping multiple generations on their ancestral lands is only possible with economic growth and sustainability. The Vardenis-Mardakert Highway project is at the intersection of these three goals. It will hasten the transport of goods and supplies so that local businesses can reliably serve customers and regional trade can increase.” Mr. Bandazian also noted Armenia Fund USA’s generous support of and first-hand experience with building the Goris-Stepankert Highway, and later, with the North-South Highway that connect Armenia’s communities with Karabakh. “Given our track record, our affiliate is uniquely equipped to help make this project a success,” he said. The road from Vardenis in Armenia to Mardakert in Karabakh, totals 96.7 kilometers. It covers such varied terrain that there are multiple construction, engineering, and public safety challenges involved. For example, there is a significant stretch of unpaved, dirt-covered road that changes dramatically in width at different intervals and involves as many as 339 sharp turns, 17 of which are serpentine configurations. Other sections have been partially blocked due to landslides or river swells, adding to the hazardous conditions. Finally, new road signage, protective barriers and other modern standards of road safety must be installed to meet current government regulations.